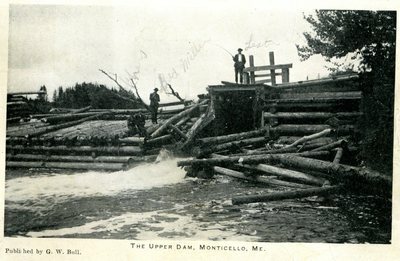 "Monticello, Maine, Upper Dam "
An image scanned from a black and white postcard of four men on the upper dam in Monticello, Maine. Handwriting on the postcard identifies names of some of the men, and appears to say Bud Miller and Lester. Text published at the bottom of the card reads, "Published by G. W. Bull." The card was mailed to Miss Grace Sewell in October, 1909.